Winnipeg Man Recalls Sighting - Sasquatch Canada contains current and authoritative information on sasquatch and other homins. WINNIPEG - After a half century of nightmares, Winnipegger Archie Motkaluk, 70, has finally revealed the secret behind his decades of sleepless nights. Christmas Day at home on Lipton Street, with all the family around him, Archie brought out a book containing handwritten notes and a drawing of the Sasquatch he had a very up close and personal encounter with back on December 29, 1960. One by one, the family took Archie's book into a room adjoining their dining room, and read details of the day Archie clearly remembers standing face to face, eight feet away from a female Sasquatch in the bush near Swan River, Manitoba, and wondering what was going to happen next. Home for Christmas from attending school in Winnipeg, Archie was visiting his parents farm near Renwer, Manitoba (south east of Swan River) and had taken a team of horses and the sleigh to go chop some wood three miles or so into the bush back of the farm. With the horses tied to some nearby brush, axe in hand, 10:30 a.m., Archie was chopping deadfall when about 400 yards across the clearing he was in, he spotted what he believed to be a man slowly heading his way, stopping every few minutes to examine the bushes. Wasn't quite sure what the guy was up to, but by the time the "man" got within a hundred yards or so, Archie realized his visitor was a Sasquatch, who, shortly after, confronted Archie in a manner that left him literally frozen in place till the fear subsided enough for both him and the Sasquatch to take a few steps back. So why did he wait 50 years to tell his story? Seems Archie was recently watching a television program in which the guest declared there is no such thing as a Sasquatch, and Archie just couldn't let it go. He decided regardless of the outcome, it was time to share his experience. His description of the event is fascinating, particularly when he details the physical appearance, and behaviour of his somewhat nerve-wracking forest friend. Archie tells me the only person he ever told of his encounter was his mother upon arriving home that day, who got him to sit down and draw a picture of it, the same picture he displays at the front of his notebook, now featured beside a Sasquatch pic one of his grandchildren got online. Following the interview with Archie, I called University of Manitoba Science writer Chris Rutkowski, to ask if he was aware of any other Sasquatch sightings reported from the area. He recalled Sasquatch sightings at Easterville in 1968 and 1970, one of them reported by a school principal. 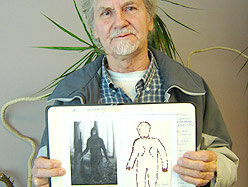 Googling Manitoba Sasquatch sightings I also found another report, this one on video, from March of 2007 near Peguis. So now, Archie's tale, as with all other reported sightings of Sasquatch/Loch Ness monster type experiences, is yours to believe, or not; dismiss or discuss; mock, or chock up as yet further proof that Sasquatch lives, and walks the woods of Friendly Manitoba. Archie Motkaluk is a Canadian born to Ukrainian parents, although much of their immigration paperwork says “Austria Galicia”. His father immigrated in 1903 and was already married. Archie is one of 11 children in this family. The family farmed near Renwer, Manitoba, which is about 20 miles from the nearest “larger” town, Swan River. Swan River had about 3000 people in 1960. Archie’s father had arthritis and found farming quite difficult. All of the children were expected to help. After his high school graduation, Archie spent two years mining in Thompson, Manitoba. Thompson is about center in Manitoba, while Renwer/Swan River is near the Saskatchewan line and further south—at about the same Latitude as Saskatoon, Saskatchewan. The farms were laid out east to west about a mile wide for each property. The property then extended several miles. Archie recalls that there were about 8 farms, and all backed onto the “Crown Land” Boreal Forest. This forest separates the tundra of the north from the deciduous forests of the south. It is about 1000 km wide and stretches from the westernmost part of Newfoundland through to the Yukon/Alaskan border. It is a vast amount of Canada’s land mass, yet only houses 14% of the population. The northern part of the Boreal Forest is quite cold and has fewer trees, the size of which gets smaller the further north you go until reaching the tundra. The area of the Boreal Forest where Renwer is located is rich in natural resources, and heavily forested. Species populations currently found there probably began about 5000 years ago, well after the retreat of the Wisconsin Ice Sheet. Regions are largely uniformly grown; mass amounts of flora damaged in cyclical disasters like fire or insect manifestation. These naturally occurring events would wipe out widespread areas, then the areas would all regenerate at about the same time. Prior to modern man settling there, the cycles were 75 to 100 years, and in some areas that is still the case. Deforestation due to humans has been minimal across Canada in these regions, although it does occur. Currently, the Canadian Boreal Forest is still 91% of what it was prior to European encroachment. Fauna in the area include shrubs, mosses, and lichens. Willow, alder, blueberry, red-osier dogwood, and honeysuckle, produce bright-coloured or conspicuous berries that attract fruit-eating birds and provide food for mammals. The Canadian Boreal Forest is populated with thousands of living creatures. It is a breeding ground for over 12 million water fowl and millions of land birds as diverse as vultures, hawks, grouse, doves, cuckoos, owls, nighthawks, swifts, hummingbirds, kingfishers, woodpeckers and passerines. There are 1.5 million lakes in Canada’s Boreal Forest and large boreal lakes have cold water species of fish like trout and whitefish, while in warmer waters, species include northern pike, walleye and smallmouth bass. There are about 130 different species of fish in the area. This forest shelters more than 85 species of mammals, including wood bison, elk, moose, woodland caribou, grizzly and black bears, and wolves as well as smaller species, such as beavers, snowshoe hares, Canada lynx, red squirrels, lemmings, and voles. The snowshoe hare is the most ecologically important as it is food source for many of the local predators (both mammals and birds) and feeds on the forest’s various plants and shrubs. It is estimated that 32,000 insect species are present, although about one third of these species have yet to be described. Several are particularly well adapted to their habitat-- black fire beetles have infrared sensing organs on their bodies that allow them to track the heat of forest fires as they search for freshly burned trees on which to lay their eggs; the white-spotted sawyer beetle use their long antennae to sense chemicals in smoke and charcoal to achieve the same goal. These two beetle species are an important part of the diet of several bird species commonly found in burned forests. Aside from the farmers at the very south edge of the forest, the area is home to about 80% of Aboriginal peoples in Canada. At this point, not much damage has occurred due to issues like population, pollution, flooding for hydro power, mining and drilling, or climate change. These things do happen, but it is usually much localized and the government, both national and provincial, are starting to take steps toward regulation and preservation. One of the most intensive studies is that of the permafrost thaw and how that will affect the peat and wetlands in the area. Additionally, there is recurring drought in some areas of the forest bed, causing issues for plant life there. There are 5.7 million square kilometers of Canadian Boreal Forest and roughly 6% of this is permanently protected. Another 4% is currently temporarily protected. There are 90 species listed as endangered (465 for all of Canada). Aside from a small Provincial Park east of the Renwer area, the Boreal Forest of concern in this report is not protected lands. It is currently considered part of “Agro Manitoba”, the most densely populated part of Manitoba. Some measures are already in place, but the government is attempting to assist landowners with ways of preserving privately owned property for conservation into perpetuity. The Renwer area is home to several animal species, but the only remotely upright animal of significant size is the American Black Bear. Although they do have a period of dormancy during the winter, they do not fully hibernate. It would thus be possible for Mr. Motkaluk to have seen one on December 29, 1960 in the Boreal Forest at the back of his father’s farm tract. Realistically, since he had lived on the property for 20 years—all of his life—he would have known well what a black bear looks like. His certainty that what he saw was not a bear cannot be doubted. What did Archie Motkaluk see that winter day? He saw an upright being, immediately thought to be human, walking at the edge of the woods. He was not under the influence of any alcohol or medication. He was a healthy 20 year old man, in the area to cut wood for the family farm. Archie Motkaluk was one of 11 children who worked this family farm. He knew his way around animals, both domestic and wild. From about age 12 he was included in hunting parties to bring back game for food for the family. He knew how to use a gun, and in fact had one with him that day. He brought it because he knew he would be in the presence of animals, and poor farmers of the 1960’s would not pass up an opportunity to bring back meat if the occasion arose. He did not necessarily feel he needed protection; he simply was prepared for hunting if he saw anything worth bringing home. He had travelled the approximately 3 miles from the farmhouse with a team of horses and a small sleigh for carrying the firewood back. He tethered his horses to a tree that appeared to be dying, and he took his axe to the tree line. The area where the family gathered their wood was a relatively large clearing, about 400 square yards, which Mr. Motkaluk identifies as “about the size of four city blocks”. He had been there hundreds of times in his 20 years. He left the farmhouse at about 10am that day. It was not snowing, as the area had considerably less snow than normal that year. In fact, there were only about 4 or 5 inches of snow on the ground. He also recalls that it was not particularly cold, but in Manitoba that could still mean well below zero. Records indicate that a record high for the area was 10C on December 1, 1960 in Brandon, Manitoba, and the average high for the Renwer area at the end of December is about -10C. Average snowfall for the month of December there is 26cm and no records were set at any date near the time of Mr. Motkaluk’s event. Nearby Swan River historical weather data shows the high was -2C and the low was -14 with no new snow for the previous four days. At the far end of the clearing, Mr. Motkaluk saw what he believed to be a man. It stood on two feet, completely upright, and he assumed it was one of the local farmers hunting for meat for the family. The man was walking slowly along the edge of the trees, stopping occasionally to pick and eat what Mr. Motkaluk believes was “cranberries and frozen chokecherries”. Boreal Manitoba native fruit species include the beaked hazelnut, blueberry, bog cranberry, buffalo berry, bunchberry, choke cherry, cloudberry, currant, elderberry, gooseberry, wild grape, hawthorn, high-bush cranberry, lingonberry, mountain ash, pin cherry, prickly pear cactus, wild raspberry, wild rose, Saskatoon, and wild strawberry. It is entirely possible that the creature was foraging for fruit left on the bushes and vines. Mr. Motkaluk continued to watch the “man” as he was chopping his wood. After about an hour, the “man was approximately 100 yards away. It was at that point Mr. Motkaluk noticed something was wrong. By the time the creature was 50 yards away, Mr. Motkaluk believed he was seeing a Sasquatch. After graduating high school, he had worked for two years in the mines near Thompson, Manitoba. Many of the workers there told stories about the creature, and this sparked enough interest for Mr. Motkaluk to seek out magazine and newspaper articles on the subject. There weren’t many available at the time, but he says he would read anything he found on the subject. Through the stories and the articles, he believed that Sasquatch would only be found in British Columbia. With a mere 50 yards between them, Mr. Motkaluk stopped chopping wood and watched. The creature came to within 8 to 10 feet of where he was standing. Mr. Motkaluk is 6’4” tall and at that time weighed about 220 pounds. He describes the sasquatch as slightly shorter and about 325 pounds; and female. He could not see genitalia, but breasts were clearly evident. The two stared at each other and the creature made snarling, hissing, groaning, and grunting sounds, as well as grinding its teeth. This went on for what seemed like 6 or 7 minutes. Then the animal stopped making noise and they continued to stare at each other for an additional 4 or 5 minutes. Mr. Motkaluk says he felt frozen to the spot, unable to move. Eventually, he was able to take a step back. When he did so, the Sasquatch also took a single step back. They continued this pattern, with each taking two or three steps backward until they were about 20 yards apart. The Sasquatch turned and again began foraging for food, and Mr. Motkaluk returned to his sleigh. Once seated on the sleigh, he began to relax and ate his lunch. He then took his axe—and this time his rifle—and went back to chop wood. The Sasquatch was still there, watching him. Because of the close proximity, Mr. Motkaluk was able to get a quite detailed description. He says the Sasquatch was covered in very fine hair, dark brown in color. The hair was no longer than one inch and was shiny, much like a domestic house cat. It had a light brown face without hair, although the hair did continue onto its neck. Only the back of its ears had fur. He describes the visage as that of a “middle aged aboriginal with a stern face”. Its teeth were wider than normal human teeth, he estimated about 5/8 of and inch wide. There were no distinct canines (or fangs as he described them) leading Mr. Motkaluk to believe the Sasquatch was strictly a vegetarian. The soles of its feet and the palms of its hands were grey, and the tops of each had the same fine hair. Mr. Motkaluk said it “looked very human” and nothing at all like a monkey or other primate. The arms were proportional to the body in the same way as a human. The fingers were a bit fat, but not disproportional to the overall size of the animal. He likened it to photos he has seen of Neanderthal Man. There was no distinct smell of any kind. The animal appeared very clean and well groomed. Its face was distinctly human. The nose was slightly larger than average, but definitely not flat like a primate. There were eyebrows of a darker color than the face, as well as very human looking eyes. He believes they were brown. Ears were clearly visible and looked human. He jokingly said what he saw was basically a 325 pound hairy woman. Mr. Motkaluk said that many enthusiasts describe Sasquatch as having no neck but that is definitely not the case. What he saw had at least a 3 inch tall neck and was able to look from side to side without turning its body. He did say that he does not believe Sasquatch is capable of running, at least not fast. He describes the gait as a side to side wobble, again much like a large and heavy human woman or perhaps a child who is just learning to walk. He also said that from time to time the Sasquatch would have difficulty picking up the small berries from the ground or the bushes. The Sasquatch stayed in the area with him for a total of about 4 hours. Mr. Motkaluk finished his wood chopping and loaded his sleigh and returned home. He is certain the Sasquatch was still standing there watching him when he left. Archie Motkaluk returned to his family farm at about 4pm. His father reminded him to groom and stable the horses, and after that Archie went into the house. His mother was immediately concerned and asked what was wrong, saying he “looked white as a ghost”. Archie assured her there was nothing wrong and retired to his room where he wrote the whole incident down. He had no “regular” paper so he wrote it on brown paper bags. When he returned to his mother, she would not let up and urged him to tell her what was wrong. He told her of the sighting and she had him draw what he saw. His mom was an avid reader and knew of Sasquatch and never tried to tell him he was mistaken. He took his writings and drawings and put them in an envelope, where they stayed untouched in his basement in Winnipeg for nearly 50 years. Mr. Motkaluk was raised Ukrainian Orthodox and still considers himself of that faith. He has had no other events in his life that he would consider paranormal. He has had recurring nightmares of the encounter, and for the first 10 years after the sighting he sought medical help to get to sleep. Otherwise, he doesn’t think the encounter has changed anything. He was watching Outdoor Life Network (OLN) and was interested in a show about Bigfoot/Sasquatch. There was an “expert” from the Pacific Northwest who said that the phenomena were not real but rather a product of overactive imaginations. Mr. Motkaluk was outraged. He decided that his story needed to be told; until that time he had told nobody except his mother because when he would think about it he would become upset. His wife of almost half a century did not even know. He talked to her, and then he rewrote his notes into an article and attempted to get it printed in the Winnipeg Free Press. Because it was 11 pages long, they refused to run it so he took it to the Winnipeg Sun. They questioned him for two hours about what he had seen and finally decided he wasn’t lying. They promised to run his article, but in fact ran only a small human interest piece based on the interview. Since then he has been on the radio once, and was promised to be brought back for a call in show. That never materialized because the station felt it had become “old news”. Mr. Motkaluk is clearly frustrated with media and is not seeking any fame or recognition with his sighting experience. He has not attempted to “sell” his “story” in any fashion. He said he had been contacted by researchers from all over North America, about 200 people in his estimation. I spoke with Mr. Motkaluk for well over an hour on a Friday evening via telephone. I found him to be very likeable, of at least average intelligence, and very proud of his “farm boy” heritage. I saw no signs of mental illness, including Alzheimer’s, nor do I believe he manufactured his sighting. I encouraged him to protect his original notes and drawings and to carefully select someone to receive them when he is no longer able to keep them. Although his exposure to discussion of Sasquatch prior to his sighting is somewhat problematic, what he describes is not typical media information. Mr. Motkaluk’s testimony is compelling in its detail and the supporting possibilities—dense forestation, minimal human population, abundance of vegetation for subsistence—makes a good case for the acceptance that the Sasquatch phenomenon is real. I’m convinced that it is definitely real for him, and likely for his family members who now know the story.